Big brother Stan explaining life to Eugene in "Brighton Beach Memoirs"
Eugene Morris Jerome is a large moniker to be saddled with, especially if you’d prefer to be called Bob or Tony. The angst of teenage years and the onset of puberty are exacerbated for Eugene as he copes with his extended family’s bountiful supply of problems. While he’d rather be daydreaming about playing World Series baseball games for the Yankees or even, God forbid, the Cubs, he finds himself caught up in the myriad crises in his household from his brother Stanley’s business ethics and get rich quick schemes to his cousin Nora’s Broadway career opportunities to his father Jack’s stress induced heart attack. The fact that another World War might be around the corner is also a major concern. Evan Thompson is wonderfully genuine as a young teenage boy caught up in his family’s dramas, suffering through dinners of liver and lima beans (hopefully not in the same night), worrying about his aunt’s asthma and poor eye sight, his cousin Laurie’s fluttering heart, his father’s sudden attack, his brother’s possible enlistment into the army and his fifteen daily trips to the grocery store for two tablespoons of flour and three teaspoons of sugar, thanks to his mother’s thrift-induced measures. Lester Colodny directs a fine cast that includes Marla Manning as his always worrying and caring mother, Steve Yudelson as his advice-giving and compassionate father, Kellan Peavy as his big hearted and conflicted brother Stan, Elizabeth Young as his trying hard to be happy and helpful aunt Blanche, Jacqueline Rowland as his ambitious and talented cousin Nora and Leah Nashel as his precocious and pampered cousin Laurie. A homey set is created for this 1937 Brighton Beach, Brooklyn, New York neighborhood story. Let Eugene share moments of despair and ecstasy as he tries to survive his teenage years and perhaps get a golden glimpse of paradise (for at least two and a half seconds) in the process. Elvis has clearly left the building if we’re talking about Graceland or Nashville, but you can find his essence weekends at Connecticut Cabaret Theatre in Berlin where the action is “All Shook Up.” A new musical comedy conceived by Joe DiPietro, inspired by and saluting the songs of Elvis Presley, will have you swiveling your hips, donning a black leather jacket or a pink poodle skirt and a pair of beautiful blue suede shoes, until Saturday, August 25. Think “Footloose” meets “Cyrano de Bergerac,” collides with “A Midsummer’s Night Dream,” with a touch of “Romeo and Juliet” and you’ll be close to what happens in a small Midwestern town in 1955 where a opinionated and prejudiced Mayor Matilda Hyde, captured by a powerhouse Melinda Learned, keeps a tight rein on everybody’s actions and thoughts. Prescribing to the Mamie Eisenhower Decency Decrees, the Mayor has forbidden loud music, tight pants, dancing, public necking and any interracial dating. Her moral compass is stuck at zero tolerance. The calm and quiet is disturbed and disrupted when a stranger rides into town on a motorcycle and begins to question the stable and staid status quo. Matthew Collin Marrero’s Chad is a rebel and a roustabout and proud of it, and he will change the town whether it’s ready or not. Chad has such an effect on the local auto mechanic Natalie, a sweet Jessica Frye, that she disguises herself as Ed to win his approval and affection. When it comes to being cool, town folks like Natalie’s dad Jim (Steve Sorriero) and her good friend Dennis (Jonathan Escobar) line up to take lessons. When Chad thinks Miss Sondra (Emily LaRose) is the cat’s meow, he sends Ed to woo her, only to have Sondra fancy herself smitten by Ed instead. 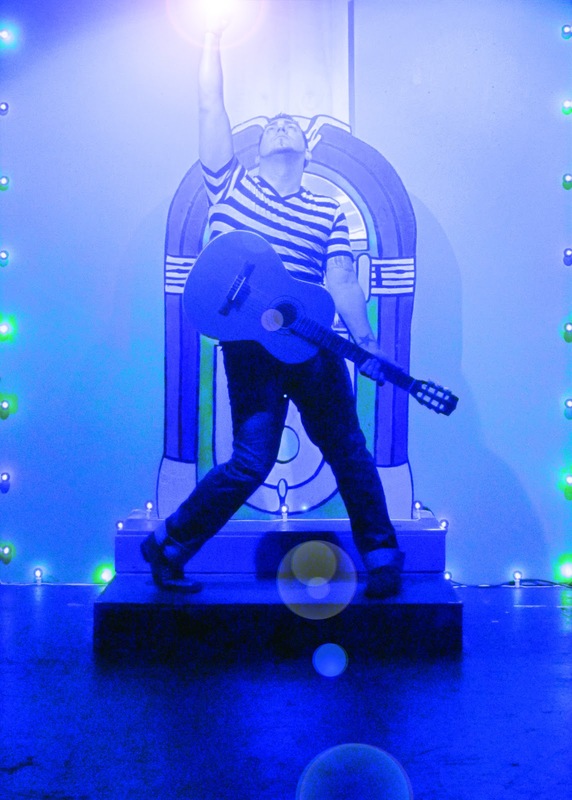 More than two dozen great Elvis tunes like “Jailhouse Rock,” “Hound Dog,” “Teddy Bear,” “Blue Suede Shoes,” “Don’t Be Cruel” and “Burning Love,” under the musical direction of Pawel Jura, keep the rafters rocking. This fine regional cast, under the direction of hunka, hunka happy Kris McMurray, also includes an ensemble of Kate Branstetter, Linda Kelly, Sandra Lee, Lyndsi Skewes, Maggie Sloan, Michael Falconeri, Roger MclLwain, James J. Moran and Brandon Secco. For tickets ($30), call Connecticut Cabaret Theatre, 31-33 Webster Square Road, Berlin at 860-829-1248 or online at www.ctcabaret.com. Performances are Friday and Saturday nights at 8 p.m., with doors opening at 7:15 p.m. Now is the time to renew subscriptions for their sixteenth anniversary season. Remember to pack goodies to share at your table or buy dessert and drinks at the concession stand. 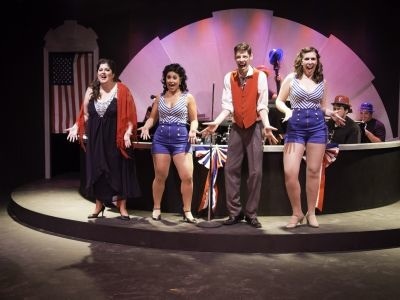 You “Can’t Help Fallin’ in Love” with Chad and the gang as they “Follow That Dream,” declaring “It’s Now or Never.” Bebop on over to Berlin and enjoy the finger snapping, toe tapping fun. Theater of Connecticut’s production of Lucia di Lammermoor. When you think of feuding families and forbidden love, the first names to come to mind might well be Romeo and Juliet, Shakespeare’s most famous star-crossed lovers. But they are clearly not the only pair in history to endure parental disapproval and family problems. Consider an emotionally fragile young girl Lucia whose clan has a long standing disagreement with the Ravenwoods, in the hills of Scotland in the 17th century. Lucia is in love with Edgardo, but her family hates his and forbids the union. They have been meeting secretly in her castle but the captain of the castle guard, Normanno, suspects the pair of trysting and informs her brother Enrico. Meanwhile the couple defiantly take vows and exchange rings. Because the family’s fortunes are waning, Enrico has pledged Lucia, against her will, to Arturo to restore their wealth and power. For political reasons, Edgardo is forced to leave Scotland to go to France and in his absence Enrico shows Lucia a letter he has forged proving Edgardo has taken a new lover. Lucia sees a ghost warning of death, Edgardo returns and is challenged to a duel, Lucia is forced to wed Arturo and goes mad, Enrico realizes the tragedy that his actions have caused and both Lucia and Edgardo are reunited in death, much as Romeo and Juliet were. 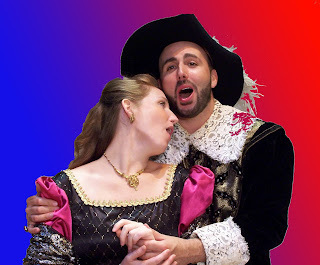 To be caught up in the drama and tragedy in this spellbinding opera penned by Gaetano Donizetti in 1835, plan to attend the sterling production of “Lucia di Lammermoor” being staged by Opera Theater of Connecticut at the air-conditioned Andrews Memorial Theater, 54 East Main Street, Clinton on Tuesday, August 7, Thursday, August 9, Saturday, August 11 at 7:30 p.m. and Sunday, August 12 at 6 p.m. Opening night will include a gala reception. Come hear the soaring score as coloratura soprano Amanda Hall as Lucia, tenor Luigi Boccia as her lover Edgardo struggle against the will of David Pershall, baritone, as the forceful brother Enrico who wants Lucia to marry Arturo, tenor Michael-Paul Krubitzer. The interfering head of the castle guards Normanno, tenor Jorge Prego, starts the confrontation while Lucia’s maid Alicia, mezzo-soprano Karolina Wojteczko, only wants to help her lady be happy. Even Lucia’s chaplain and tutor Raimondo, bass Daniel Hague, is unable to persuade her to renounce her vows to Edgardo. The opera will be sung in Italian with Supertitles to enhance understanding and enjoyment. Opera Theater of Connecticut was founded in 1986 to help professional artists hone their craft and to encourage the public to experience high quality productions affordably and intimately. To that end, Artistic Director Alan Mann personally conducts Opera Talk, an informal, informative talk about that evening’s opera and composer, one hour and a half before the performance ($5.00). In 1989, when Alan Mann first produced this stirring opera, he received a card from the famed maestro Richard Bonynge and Dame Joan Sutherland that "Lucia di Lammermoor" was "an opera that never fails to please" and now, more than three decades later, Alan Mann "agrees totally" with that pronouncement. For tickets ($40, seniors $38, under 18 $34), call Opera Theater of Connecticut at 860-669-8999 or online at www.operatheaterofct.info. Boxed suppers Al Fresco Style from Chips Pub III can be pre-ordered for $15 two days in advance by calling 860-669-8999. Let Donizetti’s tragic gothic psychological thriller take you on a spectacular ride to the moors of Scotland where feuding families drive their loved ones to madness, murder and suicide. “JOSEPH AND THE AMAZING TECHNICOLOR DREAMCOAT” IS AMAZING! Just for the sheer fun of seeing Elvis pop up smack dab in the middle of a Bible story is worth the time to travel to New Canaan. But there is so much more! 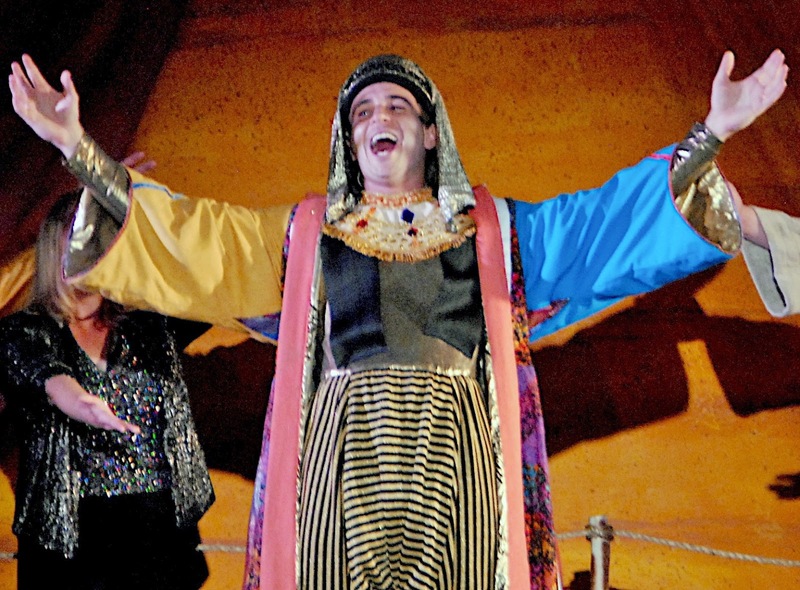 The Summer Theatre of New Canaan has set up a glorious tent on the grounds of lovely Waveny Park until Sunday, August 5 to unveil this outstanding production suitable for the whole family. The Biblical tale of Joseph and his eleven brothers is narrated by a harmoniously blessed Corrine C. Broadbent who helps the story come to life. All does not bode well when the father of the clan, Jacob (Brian Silliman) singles out one son, Joseph, a gifted lad in the hands of Christopher De Rosa, as being superior among his siblings. Green eyed jealousy consumes the neglected eleven: Dru Serkes, Adam Hill, Richard Hartley Weidlich, Kenneth Linsley, Johann Michael George, Bobby Godas, Nick Giuliani, Christian Libonati, Chase Jansen, Benjamin Edward Simpson and John Galas. Things change when two events occur: Joseph boasts of his superiority when he interprets dreams where his brothers bow down to him and Jacob presents Joseph with a most beautiful coat of rainbow hues. To rid themselves of Joseph, the lads sell him off as a slave to a band of traders traveling to Egypt and tell a brokenhearted father that his favored son is dead. How Joseph lands on his feet, becomes a slave and escapes the clutches of his owner’s wife (Grace Hardin) and becomes indispensable to the Pharoah, a gyrating William Hammons, is beautifully told and sung through a series of great songs that spin from country western to rock and roll, calypso and ballads, and even acquire a French accent along the merry way. Each of the almost two dozen songs is a gem. The choreography by Doug Shankman is over-the-top grand, on a clever tiered set designed by Charles Pavarini III, with a trunk full of costumes created by Arthur Oliver, all lit magically and mysteriously by Devon Allen. The wonderful cast is assisted by an eager-to-please chorus of sixteen children, all orchestrated beautifully by director Melody Meitrott Libonati. For tickets ($30 and up), call STONC at 203-966-4634 or online at www.stonc.org. Performances are Thursday, Friday and Saturday at 8 p.m. and Sunday at 3 p.m. Follow the favored son as he learns being singled out as special can be greatly dangerous and dangerously great. What might you think if you hear reports about a man that alternately paints him as virtuous or villainous, benevolent or brutish, saint or sinner, meritorious or monstrous, righteous or rake, angelic or arrogant, charitable or charlatan? You would be likely to take one side over the other and believe the best or the worst. You will have your chance to pronounce character judgment in the manner of one gentleman in question and unmask the truth for yourself if you attend Westport Country Playhouse’s unique production of the Moliere comedy “Tartuffe” until Saturday, August 4. This charming adaptation by Richard Wilbur is in rhyming verse and was originally penned by Moliere in 1664, yet it retains its cleverness and humor to this day. If you believe Orgon, a pompous and opinionated Mark Nelson, Tartuffe is the epitome of virtue, a man pious and worthy of God’s grace. Yet everyone in Orgon’s family, from the sassy and saucy servent girl Dorine (Jeanine Serralles) to his obedient wife Elmire (Nadia Bowers), his daughter Mariane (Charise Castro Smith), his son Damis (Justin Adams), his brother Cleante (Tyrone Mitchell Henderson), all wholeheartedly subscribe to Tartuffe as a fraud and hypocrite, out to get everything Orgon is so gullibly eager to give him. The only other person siding with Orgon is his totally focused mother (Patricia Conolly) who is, unbelievably, even more enamored by this roué. So smitten is Orgon with the chameleon-like Tartuffe, cloaked in snake skin smoothly and suavely by Marc Kudisch, that he promises Tartuffe can marry his daughter, even though she has pledged her love to the faithful Valere (Matthew Amendt). When Orgon disowns his own son and signs over his estate and all his worldly goods to Tartuffe, he finally goes too far and forces Elmire to unmask the crafty scoundrel and reveal him for the evil schemer he truly is. David Kennedy directs this farce that starts slowly but builds to a most satisfying conclusion. Watch the naïve benefactor Orgon have his rose colored glasses surgically removed as he is tricked into seeing Tartuffe for the deceitful and dishonorable scamp he truly is. Under a full moon, when young romance should be protected and nurtured, the enmity of two feuding families causes tears and troubles for a pair of innocent lovers. Enter the ancient lands of Verona, Italy, at the invitation of William Shakespeare, to witness how Romeo of the house of Montagues meets and falls under the spell of the bewitching Juliet of the house of the Capulets. Connecticut Free Shakespeare has set up a perfect place for your viewing pleasure, outdoors under a star-crossed sky, at three unique venues at 8 p.m.: CT's BEARDSLEY ZOO, Peacock Pavilion, Wednesday to Sunday July 18-22 – for the 13th year – peacocks are still making their presence known. McLEVY GREEN, Wednesday to Sunday, July 25-29 – Downtown Bridgeport is undergoing a revival. There are now many, many evening and weekend music and art events. Mayor Finch believes classical theater belongs there, too and invited CFS to perform. FESTIVAL! STRATFORD on the grounds of The American Shakespeare Festival Theater – Wednesday to Sunday, August 1-5. – Volunteers are working hard to open the theater again. Performances by CFS will help keep their dream alive. There will be a photo exhibition on display with historical theater images. In Stratford, Paul Newman, Christopher Plummer, Maureen Stapleton and Bob Dylan appear in a series of iconic images captured by photographer Jayson Byrd of Westport to be exhibited in the lobby of Stratford’s American Shakespeare Festival Theatre. You can bring your own picnic, blanket and lawn chair. photographer of extensive list of theaters like the Shakespeare in Stratford, Westport Country Playhouse, Darien Dinner Theater, Boston Post Road Stage Company, Polka Dot Playhouse, Stamford Theatre Works and Music Theatre of Connecticut. Live jazz and music on the lawn, plus yoga and zumba, enhance the production in Stratford. Additional information is available at www.festivalstratford.org or Festival Stratford on Facebook. A charming Romeo, played by an eager Mark Friedlander, fancies himself enamored by Rosalind but when he accidentally spies Juliet, a sweet Erin Scanlon, at a masquerade ball he should not even be attending, his heart is well and truly lost to the lovely innocent teenage girl. Aided by Juliet’s accommodating and caring nurse (Liliane Klein), the pair steal away to Friar Laurence (Jamil Mangan) where they are secretly wed. A chance encounter between the rivals, Mercutio (Eric Nyquist), Romeo’s best friend, and Tybalt (Stephen Humes), Juliet’s cousin, leads to a sword fight where Tybalt slays Mercurio and, in the ensuing struggle, falls on Romeo’s sword. When Romeo is banished and exiled to Mantua, the newly married couple are quickly parted. Juliet’s parents (Jonathan Holtzman and Virginia Bartholomew), renew their pressure for Juliet to marry the quite eligible suitor Paris (Tom Evans), not knowing she has already pledged her heart to another. A lost letter and vials of poison bring renewed tragedy that finally leads the Capulets to abandon their feud with the Montagues (Jerrial Young and Lila Smith). A chastised Benvolio (Ian Eaton) explains the tragic turn of fate. 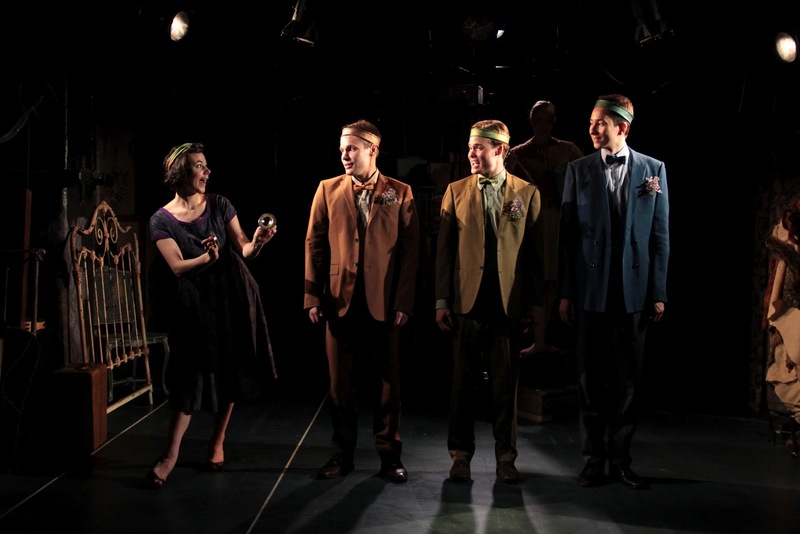 Kudos to Ellen Lieberman for adapting and directing this magical production on a bold set designed by Lynne Porter, with an array of costumes created by Solveig Pflueger and Chris Mallardi and mood lighting by Sebastian Paczynski. 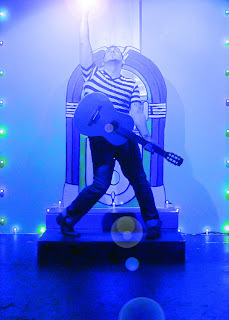 Musical director and choreographer Eric Nyquist is responsible for leading a most entertaining intermission that has half the audience of children and parents dancing and singing on stage. A Greek chorus of peacocks also lend their voices to the festivities. Donations to help offset the costs of production are most welcome. The stars are coming out in full force in a galaxy of brightness and sparkle for the Tenth Annual Cabaret Conference at Yale. If you’ve never enjoyed the shine and verve of this special week, you are depriving yourself of a theatrical treat. Bucket lists need to be updated immediately. Wikipedia lists 73 pages if cabaret singers and it doesn’t even scratch the surface. Imagine yourself at an intimate nightclub, in a haze of blue smoke, with a martini in hand, and sit back and enjoy the ambiance and atmosphere that only a cabaret singer can create. Lyrics, risqué and clever, sultry and salty, are interpreted in a language that will delight the ears, tantalize the eyes and percolate all your internal organs. New York impresario Erv Raible has once again assembled a musical menu guaranteed to please. As Executive Director and Artistic Director, he is responsible for auditioning the thirty-six students from all over the world who will come to Yale University for an intensive and extensive nine-day infusion of cabaret song stylings from the masters Raible has invited to teach by example. These are the professionals who earn their daily pumpernickel bread by warbling out the classics, pop, jazz and musical theater that mark their art. From Friday, July 27 to Sunday, August 5, Iseman Theater, 1156 Chapel Street, New Haven is THE place to be. The conference will open to the public on Saturday, July 28 with Sizzling Summer Night when Jeff Harnar and Sally Mayes perform. On Sunday, July 29 the prestigious faculty will take a star turn on stage giving the new students a tantalizing taste of what awaits them all week. Come hear Faith Prince, Sally Mayes, Amanda McBroom, Sharon McNight, Jeff Harnar, Julie Wilson, Tex Arnold, Carol Hall and Erv Raible, accompanied by Alex Rybeck and Ian Herman on piano. Thursday, August 2 will bring Women Songwriters Past and Present to the spotlight when Linn Maxwell and Amanda McBroom take the microphone. Fabulous Broadway Babies on Friday, August 3 will feature Sharon McNight and Faith Prince. On Saturday, August 4, the cadre of students will strut their own newly honed stuff as the Cabaret Stars of Tomorrow take the stage. For tickets ($35, seniors $25, students $15), call 203-432-1234 and please go online to www.thecabaretconferenceatyale.com for a delightful musical introduction to the festivities. All performances are at 7:30 p.m.
Let the stars shine and bathe you in their illumination of musical pleasure. Playhouse on Park in West Hartford has your air-conditioned seat all fluffed and ready for you until Sunday, July 29 as they present this beautifully crafted musical tribute. Ten young, talented singers and dancers are eager to introduce you to Mr. Burke’s style and lyrics as they celebrate the man and his music. Come see and hear more than three dozen terrific numbers brought to colorful life through the lovely voices and fancy footwork of Kevin Barlowski, Dakota Dutcher, Hillary Ekwall, Marissa Famiglietti, Shannon Farrell, Amanda Forker, MacKenzie Friedmann, Jenna Levitt, Spencer Pond and Scott Scaffidi. Written by Michael Leeds, “Swinging on a Star” is organized in a series of seven musical vignettes starting at a Chicago speakeasy in the roaring 1920’s, where hot jazz, flappers, bathtub gin and tunes like “You’re Not the Only Oyster in the Stew,” “Ain’t It a Shame about Mame” and “Doctor Rhythm” prove to be the cat’s meow. Soon the dark days of the Depression intrude on the festivities but tunes of hope like “Pennies from Heaven,” “When Stanislaus Got Married,” a Polish wedding gone humorously awry, a tale of a two year old’s temper tantrum in “His Rocking Horse Ran Away” and a trio of abandoned suitors in “Annie Doesn’t Live Here Anymore” lighten the mood. The musical voyage continues in Act II with a ballroom, a supper club and a fun visit to Morocco with our old friends Bob, Bing and Dorothy. Conducting this fine song fest is Darlene Zoller as director and choreographer. The lively band consists of Colin Britt and Evan Roider sharing the piano and conducting honors, with Andrew Studenski on flute, clarinet and sax, Kurt Kumme and Tucker Barney on trumpet, Chris Langhans on bass and Adam Holtzberg on percussion. For tickets ($32.50, students and seniors $30.00), call Playhouse on Park, 244 Park Road, West Hartford at 860-523-5900, ex. 10 or go online to www.PlayhouseOnPark.org to check for all the cool summer offerings. Performances are Wednesday at 2 p.m. and 7:30 p.m., Thursday at 7:30 p.m., Friday at 8 p.m., Saturday at 8 p.m. and Sunday at 2 p.m.
On Main Stage Mondays from 6 – 8 p.m., head next door to A. C. Petersen Farms Restaurant where the singing wait staff from Playhouse on Park will serenade you with show tunes while you enjoy your burgers, lobster rolls and ice cream sundaes. Be sure to get a photo of the great ice cream festooned cow outside. Grab a shiny star under the glittering disco ball and swing along with Johnny Burke and friends on a sentimental musical journey sure to be a highlight of your summer fun. When you dine in a fine restaurant, to enhance your culinary experience, you might consult the sommelier to pair your wines with your main course selections. How appropriate, therefore, to consider applying the same matchmaking arrangements when preparing a menu of theatrical offerings, in this case pairing the perfect potent potable with each one-act play of humor. “Tasty Theatre” inauguration, Keylock focused on playwright Fred Stroppel for a smorgasbord selection of savory tastes to please and probe and provoke the palette at Lyric Hall in the Westville section of New Haven on Saturday, July 14 at 8 p.m.
Keylock wisely relied on Stacey Ference from Savour Catering, LLC (203-906-7144 or online at savourfood@sbcglobal.net) to match the libations from Robert Jordan at The Wine Thief (370 Whitney Avenue and 101 Crown Street, New Haven) to the amuse-bouche appetizers, set to explode in your mouth, with the theatrical menu. Ference’s choices, all from Spain, included Barbadillo sherry with an olive and almond crustini, a Cuba Vieja rose with mushroom strudel and Flor de Raim Cava, like a bubbly champagne, with poached shrimp. Each of these summer drinks had an unexpected flavor to enhance the unfolding of each short theater piece. In “Friendly Fire,” two old pals Johnny (Daniel Sarnelli) and Carmine (Michael Crowley) meet again after an explosive encounter. Carmine tries, unsuccessfully, to justify his actions and explain why now, inexplicably, they are both dead…and in limbo. On “Street of Broken Dreams,” a puppeteer Diane (Sachi Parker) attempts to understand how her innocent dalliance with Kermit the Frog and various and sundry characters on Sesame Street has ended so disastrously. When Margie (Joanna Keylock) overindulges at a party, a good Samaritan and stranger Deidre (Laura J. Kirk) unwittingly becomes the “Designated Driver” to get her safely home, proving that no good deed goes unpunished. 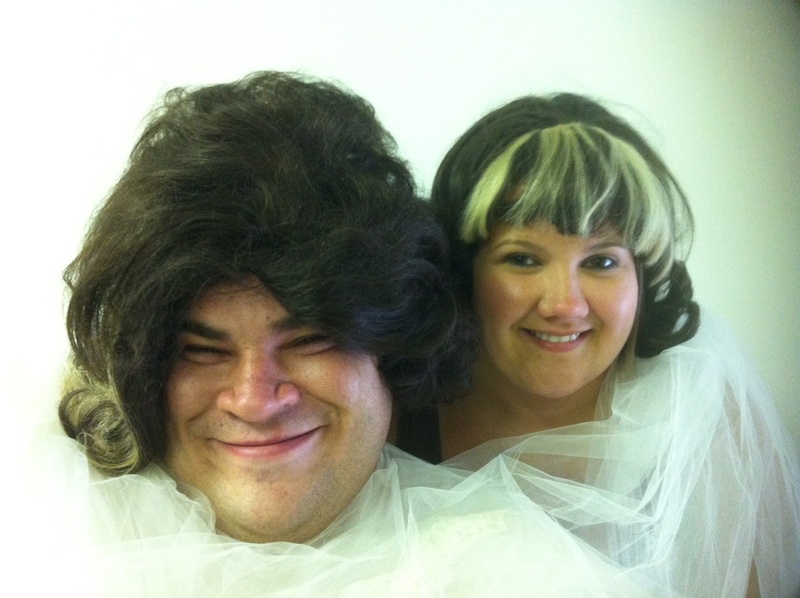 Completing the evening, meet Joanna (Nadine Willig) and Stewart (Tom Zingarelli) who have just arrived home from a marvelous event, “After the Ball.” They both loved the singer and ten- piece band, the gourmet food, the floral display, balloons and lavish party in Charlie’s backyard tent. When Stewart insists he wants the same kind of affair, a fun funeral, Joanna informs him he’s not humorous enough. For a debut evening, Joanna Keylock had standing room only. 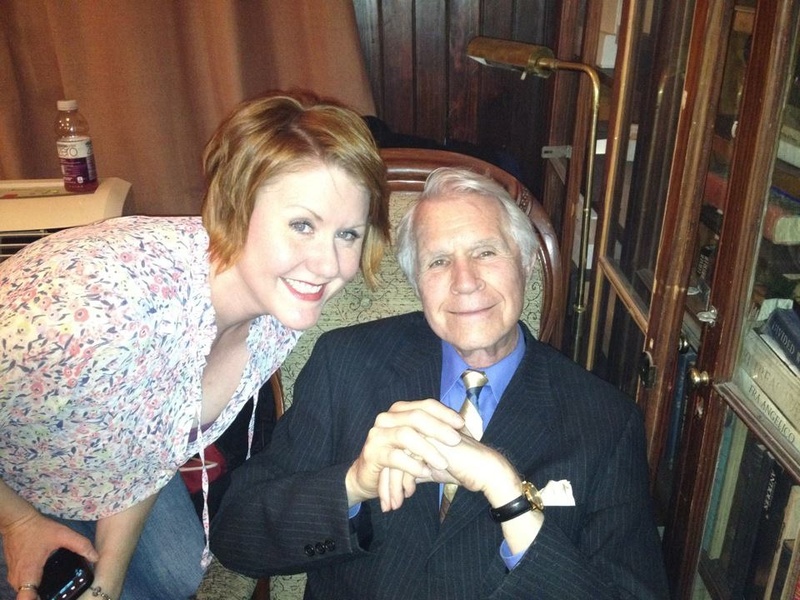 According to Joanna, “I couldn't have been more pleased with the opening of "Tasty Theatre presents Sips and Giggles." In the true character of the name, the audience sipped on wine, ate great accompanying hors d’oevres, and laughed a lot. We played to a completely sold out house and the biggest question I've been asked since, is ‘when is the next one? 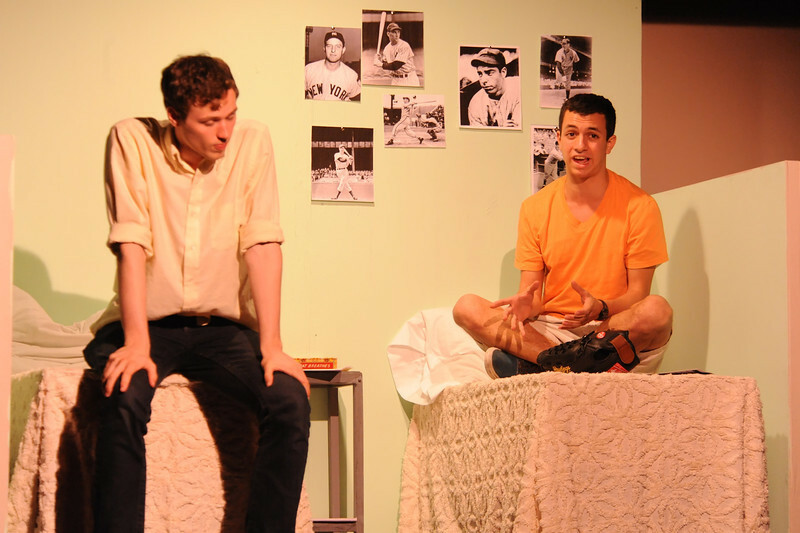 !’ " Watch eagerly for the next installment of “Tasty Theatre,” hopefully as early as September. 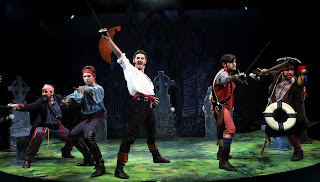 More than one hundred and thirty years ago, the writing team of Gilbert and Sullivan created a swashbuckling tale of pirates fierce and maidens fair, with an orphan lad who is mistakenly apprenticed to the dastardly crew due to an error by his hard-of-hearing nursemaid. Come meet Frederic, a duty bound all-around nice guy portrayed by Ryan N. Phillips, who because of his nursemaid Ruth’s mistake (Lynn McNutt), finds himself bound to the dashing Pirate King, a slick and suave Sean Martin Hingston, and his crewmates until Frederic reaches the prime age of twenty-one. 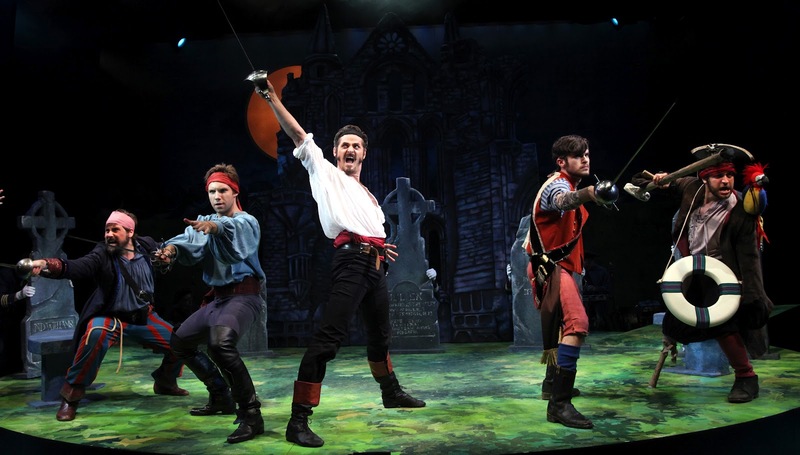 The Connecticut Repertory Theatre at the University of Connecticut at Storrs has produced a perfectly grand extravaganza of the magnificent operetta “The Pirates of Penzance” at the Harriet Jorgensen Theatre until Sunday, July 22. The adventure on the high seas begins at Frederic’s birthday party when the pirates release him from his obligation to them, one that began at his age eight. His nurse Ruth begs to go with him, to marry him, but Frederic is ready to take on the world in general and female feminine dames in particular. When a bevy of beautiful maidens, all sisters in pretty pastels with parasols, led by Mabel, a vivacious Diane Pheban, sashay by Frederic is off and running, running after them. The Pirate King and his men also set their sights on the maids and agree they would be merry to marry. The girls’ father, the Major-General, a mighty impressive Steven Hayes, has other ideas and works to stop the nuptials. Frederic receives some incredibly bad news from the pirates, after he has hired a troupe of keystone-like cops to roust them, led by the Sargeant of Police, a fleet-footed Alex Gibson. Combine the clever lyrics with the incredible fancy footwork, choreography by Cassie Abate, the sparkling fashions designed by Olivera Gajic, the mood lighting by Greg Purnell, the scenic design atmosphere created by Michael Anania, the music directed with verve by NDavid Williams and the imaginative and special direction by Terrence Mann and you have a delightfully dazzling daring-do that should not be missed. For tickets ($10-42), call the CT Rep, Hillside Road, Storrs, at 860-486-2113 or online at www.crt.uconn.edu. Performances are Tuesday –Thursday at 7:30 p.m., Friday at 8 p.m., Saturday at 2 p.m. and 8 p.m. and Sunday at 2 p.m. Put a talking parrot on your shoulder, a patch over your left eye, cut the air with a long silvery sword and grab a bottle of rum to enjoy the treasures of “The Pirates of Penzance” in all its swashbuckling splendor. 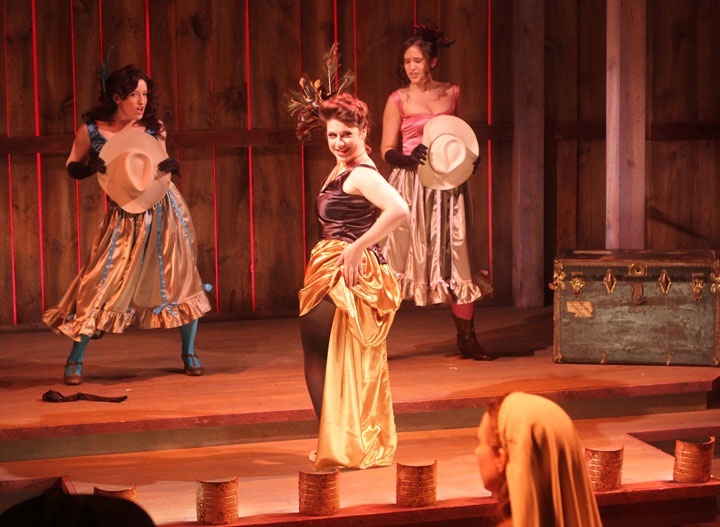 Take a convoluted Shakespeare plot, complete with betrayal, treachery, mistaken identity and masquerade, transplant it to the old Wild West, add clever lyrics and great music and you have a terrific evening of theater. Thanks to Peter Kellogg who wrote the book and lyrics and David Friedman who composed the music, you need to sashay over to the Spirit of Broadway Theater in Norwich by Sunday, July 29 for “Desperate Measures,” a new and novel musical comedy that is sure to delight. There’s no need to don cowboy hat, boots and spurs unless you want to get into the spirit of the action. Johnny Blood, a sincere and honorable Michael Sullivan, is in a peck of trouble. In the midst of defending the love of his life, a saloon girl of dubious virtue, one sassy Bella Rose, perfectly dolled up in the ruffles of Shauna Goldgood, he ends up shooting Big Swede (Calvin). Even though witnesses swear Johnny shot in self- defense, he is incarcerated and scheduled to hang. The Governor of the territory, a pompous Keith Johnson, is not known for leniency and he wants to use Johnny as an example of his strict laws and punishment for crimes. The sheriff, a dedicated Corrado Alicata, seeks out Johnny’s sister, who has not seen Johnny in years and is close to taking her final vows as a nun. He persuades the good Sister, a sweetly devout Aline O’Connor, to plead for clemency from the Governor who counters with a scheme of his own: if the sweet Sister will sleep with him, he will release her brother. How the sheriff, the Sister and Bella conspire to spare Johnny’s life and fool the Governor is the ingenious plot that saves the day. Wonderful songs like Bella and Johnny’s duet “Just for You,” Sister and Bella’s wedding gown song “It’s a Beautiful Day for a Lifelong Commitment” and Sister’s plea to the Governor “Look in Your Heart” are just some of the fun and poignant moments in song and verse. 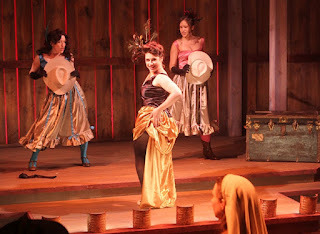 The story is aided by a friar, who is more often drunk than sober (Johnny Marion) and a pair of saloon girls (Jeanette Kearney and Kaila Galinat) who offer pithy philosophy as scene markers. Brett A. Bernardini directs this novel twist on Shakespeare’s “Measure for Measure” with a firecracker sharp shooting pace. For tickets ($30, students $25, children $20), call Spirit of Broadway Theater, 24 Chestnut Street, Norwich at 860-886-2378 or online at www.spiritofbroadway.org. Performances are Wednesday and Thursday at 7 p.m., Friday and Saturday at 8 p.m. and Sunday at 2 p.m. Inquire about their Special Spa Dinner and Theater Package. The art of storytelling, wrapped in a cloak of myths, mystery and magic, is being woven and worn beautifully at the Yale Summer Cabaret. Their “50 Nights: A Festival of Stories” features three afternoons and evenings of theater filled with fantasy from all over the world. Until Sunday, August 19, you are invited on a theatrical adventure in the dark and intimate space of the Yale Summer Cabaret, downstairs at 217 Park Street, New Haven where for more than three decades students of the Yale School of Drama have produced imaginative and involving shows. Come early and enjoy gourmet prepared snacks and meals, desserts and drinks and stay late for a special story from the Fireside Series, read outside on select evenings around a fire pit. “The Kiss of D,” or Kiss of Death, is a one woman show, written by Laura Schellhardt and directed by Tanya Dean, that stars a gifted Monique Barbee as she captures seventeen characters in one classic urban legend, a tale about what we fear as well as welcome. Travel to the small town of St. Mary’s, Ohio and immerse yourself in a story of Charlotte McGraw and how a human soul is transported into a bird. The playwright herself describes the folklore as a “psychological necessity as well as a creepy memory” since she spent her summers in St. Mary’s, often writing there. Here a sister experiences a visit from her dead brother who comes back to her in the form of a flying creature. A quite different theatrical experience can be had with “Of Ogres Retold,” conceived and directed by Adam Rigg with puppets, dance, movement, music, sound and light but no voices. The ensemble cast includes Josiah Bania, Ethan Heard, Hannah Sorenson, Mickey Theis and Alex Trow who create almost a dozen strange tales with a Japanese flavor of giants, strange creatures, magic balls of rice, jealous husbands, vengeful dragons, malevolent snow spirits, unusual fish with powers and sea monsters. Enter the dark forest and plumb the depths of the deep ocean at your own risk where all your fears, and some you never dreamed of, come to life. Don’t worry, the creative actors will be there to hold your hand. The third offering is “The Secret in the Wings” by Mary Zimmerman and directed by Margot Bordelon, with the same fine cast as noted above. Here tales from as far away as Germany, France, Italy and Norway, seven in all, are explored for their fairy tale truth, wisdom and inner struggle. A young girl is left against her will with a strange babysitter, a Mr. Fitzbania, a neighbor with a tail and many tales. He insists he wants to marry her and uses a series of unusual stories to woo her to his side. The stories are filled with kings and queens and balls, childhood games and contests that result in death to the losers, slaves and princes, many-headed ogres, swans, magic feathers and all manner of creatures we love to hate. For tickets ($25-40, student $10 or subscription packages for $70, student $29), call the Yale Summer Cabaret at 203-432-1567 or online at www.SummerCabaret.org. Come early for a fig and goat cheese tarte ($7), glass noodles with julienned vegetables ($8), a cold or hot drink or a dish of ice cream ($3)), to name but a few of the selections. Check the website for shows Wednesday, Thursday, Friday and Saturday at 8 p.m. and matinees at 2 p.m. Saturday. On Saturdays, July 14 and August 11, you can see the complete trio of performances: “The K of D” at 1 p.m., “Of Ogres Retold” at 4:30 p.m. and “The Secret in the Wings” at 8 p.m. Doors open at 1 p.m. for lunch and 6:30 p.m. for dinner. Catch a thread of this magic tapestry of tales and follow it to the core of imagination at the theatrical center. Since Corie Bratter has only been married for six days, it is completely understandable that she is floating on a cloud of love. The fact that her new husband’s feet are planted firmly on the ground could be a problem, especially since the apartment she rented for them, without his consent, is on the fifth floor, six if you count the front stoop, and elevators are non-existent. Paul Bratter, a realistic and responsible lawyer in the capable hands of Chris Brooks, is ready to try his first case in court and he does not have time to put on rose-colored glasses. Unfortunately when he looks at their new home, he sees all the flaws immediately. There’s no furniture which makes working or sleeping difficult. There’s no heat, which might not be a problem in July but it’s February. He hates showers and there’s no bath tub. The closet has a leak and the skylight has a hole…think floods and snowstorms. For an intimate glimpse of the newlyweds Mr. and Mrs. Paul Bratter, let Neil Simon be your guide in the comedy “Barefoot in the Park” being entertained weekends until Saturday, July 14 courtesy of Connecticut Cabaret Theatre in Berlin. Megan Bomar’s Corie is adorably oblivious to any drawbacks their new home might have. She is too busy being in love. When her mother, a good natured and spunky Anne Cassady or Elizabeth Dougan, comes to visit, huffing and puffing up the endless flights of stairs, she doesn’t complain nearly as much as the telephone installer (Joe Pangia) or the delivery man (James J. Moran) who barely manage to survive their Himalayan trek. When matchmaker Corie decides to introduce her prim and proper mother to the exotically different upstairs neighbor Victor Velasco, a wildly adventurous George Lombardo, anything is likely to happen and does. Kris McMurray directs this merry romp with a sure hand. For tickets ($30), call the CT Cabaret Theatre, 31-33 Webster Square Road, Berlin at 860-829-1248 or online at www.ctcabaret.com. Performances are evenings at 8 p.m., with doors opening at 7:15 p.m. Remember to pack goodies to eat at your table or buy them at the concession stand on site. Learn about how important communication and compromise, and a sense of humor, are when laying the foundation for a happy and loving marriage.